ASK HER TO FORGIVE ME. Copyright, 1896, by I. Whiteson. Words And Mush: by Fred Colin. "Pray tell to me your name?" And nearly broke my heart." A-k her to forgive me and become again my wife." 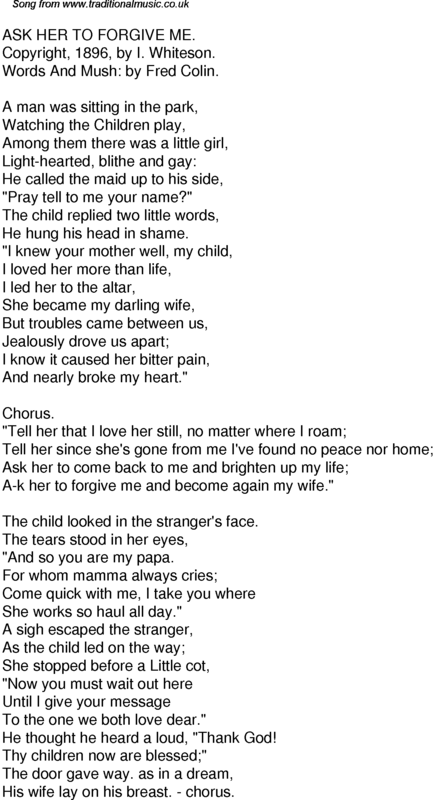 The child looked in the stranger's face. "And so you are my papa. She works so haul all day." To the one we both love dear." He thought he heard a loud, "Thank God! Thy children now are blessed;"
His wife lay on his breast. - chorus.